That’s what happened to nutritionist, Alex Jack, when he went to check out the latest US Department of Agriculture food tables. The stunning revelation came after Jack compared recently published nutrient values with an old USDA handbook he had lying around. Some of the differences in vitamin and mineral content were enormous-a 50% drop in the amount of calcium in broccoli, for example. 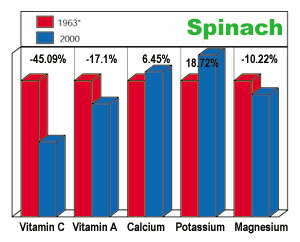 Watercress down 88% in iron content; cauliflower down 40% in vitamin C content-all since 1975.
calcium. She further explains that the problem may not even exist at all; that the apparent nutrient dips could be due to the testing procedures. For example, “changes in the public’s perception of what the edible portion is may determine what parts have been analyzed over time.” In other words, back when the old food tables were made up, people may have been eating the cobb too, so they got more nutrients. We decided to look into this further. Jack had used a 1975 version of the food tables for his research. We dredged up a 1963 version. After comparing the nutrient values for over a dozen fruits and vegetables, it was clear that the nutrient value of many foods has dropped, in some cases drastically. For example, the amount of vitamin C in sweet peppers has plummeted from 128 mg to 89 mg.= The vitamin A in apples has dropped from 90 mg to 53 mg. The fall-offs seem to be limited mostly to vegetables, and some fruits. Some vegetables appear to be gaining vitamins-at least vitamin A. Carrots, for example, have more of the vitamin now than they did in 1963. Why is a mystery. But the phenomenon has apparently occurred just in the nick of time. The National Academy of Sciences has issued an alert that it takes twice as many vegetables to get the daily requirement of vitamin A as previously thought. Carrots and pumpkin are exempt from the caveat. Despite the apparent increase of vitamin A in carrots, most vegetables are losing their vitamins and minerals. Nearly half the calcium and vitamin A in broccoli, for example, have disappeared. 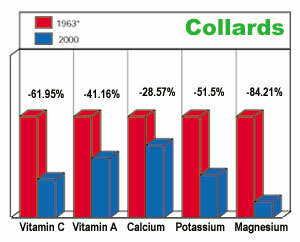 Collards are not the greens they used to be. If you're eating them for minerals and vitamin A, be aware that the vitamin A content has fallen from 6500 IUs to 3800 IUs. 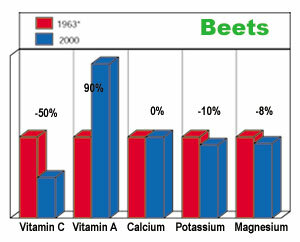 Their potassium has dropped from from 400 mg to 170 mg. Magnesium has fallen sharply-57 mg to 9. Cauliflower has lost almost half its vitamin C, along with its thiamin and riboflavin. Most of the calcium in pineapple is gone-from 17 mg (per 100 grams raw) to 7. And the list goes on and on. getting the vitamins they think they are? What about the food pyramid? Won’t a nutrient drain upset the pyramid? Already the National Academy of Sciences is telling us our vegetables don't have as many vitamins as they're supposed to. Will the USDA double the required servings of vegetables to make up for the vitamin loss? So far, no answer from the agency. The question is, what is the nature and extent of the problem? Vegetables are a major source of nutrition. Without them, humans miss out on important vitamins, minerals and phytonutrients. Many nutrients (such as folate) weren’t measured in the past. If they are also disappearing, the extent is unknown. What about more exotic nutrients such as flavonoids, or compounds like I3C? These aren’t tracked by the USDA. Are they disappearing also? “90% of women and 71% of men get less than the RDA for vitamin B6.” Dietary vitamin B-6 intake and food sources in the US population: NHANES II, 1976-1980. Kant AK, et al. 1990. “Men with the lowest amount of vitamin C have a 62% increased risk of cancer and a 57% increased risk of dying from any cause.“ Vitamin C status and mortality in US adults. Loria CM, et al. Am J Clin Nutr 72:139-45, 2000. “Lutein and zeaxanthin reduce the incidence of cataract by 22%.” A prospective study of carotenoid and vitamin A intakes and risk of cataract extraction in US women. Chasan-Taber L, et al. Am J Clin Nutr 70:509-16, 1999. “People with low levels of retinol, beta-carotene, vitamin E and selenium are more likely to get cancer.” Serum retinol, beta-carotene, vitamin E and selenium as related to subsequent cancer of specific sites. Comstock GW, et al. Am J Epidemiol 135:115-21, 1992. “Supplemental vitamin D reduces the risk of colon cancer by half compared to dietary vitamin D which reduces it 12%.” Calcium, vitamin D, and dairy foods and the occurrence of colon cancer in men. Kearney J, et al. Am J Epidemiol 143:907-17, 1996. “The area of China with the lowest micronutrient intake has the highest rate of cancer. Supplementation with vitamin E, selenium and beta-carotene lowers the rate.” Vitamin/mineral supplementation and cancer risk: internationaal chemoprevention trials. Blot WJ. Proc Soc Exp Biol Med 216:291-6, 1997. “American children have inadequate levels of vitamin E.“ Vitamin E status of US children. Bendich A. J Am Coll Nutr 11:441-4, 1992. “Flavonoids protect against stroke.” Dietary flavnoids, antioxidant vitamins, and incidence of stroke: the Zutphen study. Keli SO, et al. Arch Intern Med 156:637-42, 1996. The USDA advises that we should be eating 3 to 5 servings of vegetables plus 2 to 4 servings of fruit a day to maintain health. (A serving is one cup of something raw and leafy or one-half a cup of something either not leafy or cooked-or 3/4 cup of vegetable juice). That is potentially 9 cups of vegetables and fruit a day. That’s a lot of lettuce. Are people doing this? Harry Balzer is vice president of NPD Group, a firm that gathers information on the eating habits of Americans. His data says no way. According to him, the preferred American meal is one-dish, already prepared. Unless a vegetable can be squirted out of a bottle, it’s a nonentity. Why? We’re in a hurry. Vegetables are considered side dishes, and Americans don’t have time for such frivolity. The decline is relentless. Within the last 15 years, the percentage of all dinners including a vegetable (other than salad or potatoes) dropped 10%. It’s now 41%. This raises a big question. If people are not eating their vegetables, how are they getting their vitamins? The answer is they’re not. Study-after-study show that Americans don’t meet the RDAs for many nutrients. That’s not good considering that RDAs are probably too low to keep most people in optimal health to begin with. Americans know what they should be eating. They’re just not doing it. And they’re not likely to. According to Balzer, for example, pizza is one of America’s favorite meals. It fulfills, he says, the American ideal of being easy and fast, liked by old and young, and easy to clean up. If you blot it with a paper towel, throw on some pineapple, and use your imagination, it even seems to fit with the food pyramid. What else are people eating? Bread, doughnuts, pasta, cheese, beef and milk. Without fortified cereal, Americans would not come close to meeting RDAs. Yes, but what about the produce section? 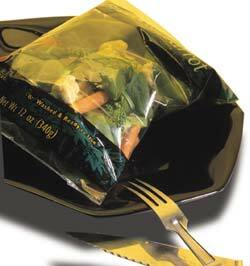 Isn’t it filled with resealable bags full of wholesome, scrubbed little carrots, prewashed salad greens and spinach? Somebody must be buying them, or they wouldn’t be there, right? According to Balzer, those puppies are highly successful, raking in a billion dollars in sales ($100M is considered successful for a new food product). But the fact that people are buying them doesn’t mean they’re eating them. The reality is that onions are most-often served vegetable in America. Tomatoes (including ketchup) are second. According to one study, less than one-third of Americans get the minimum five servings of fruits and vegetables a day, let alone the recommended nine. According to Balzer’s data, the percentage of Americans who buy healthy groceries is about 10%. The other 90% relies on ketchup, onions, fat-free snacks, ice cream, cheese and Sweet Tarts™ as their source of nutrition. Now we find out that even if a person accidentally eats a vegetable, it may not contain the nutrients it’s supposed to. What can a person do? 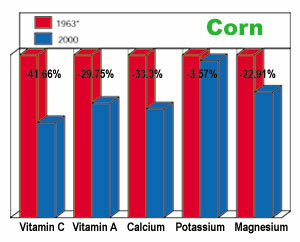 "...the nutritional content of produce is not as important as things like appearance and big yield. In other words, the view of commercial growers is that food is a product in the same way that running shoes are a product. Looks are more important than substance." Supplements have proven their worth in scientific studies. Cancer, heart attacks, bone loss, stroke and macular degeneration-most any degenerative disease you can think of can either be prevented by, or ameliorated by, the right nutrients given in supplement form. Over the long term, the benefits can really add up. For example, nurses who took multi-vitamins containing folic acid for fifteen years slashed their risk of colon cancer by 75%. Folate from food didn’t work as well. No one knows why, although bioavailability problems may be to blame. It’s estimated that about 90% of the population gets less folate per day than necessary for health (400 micrograms). In the same study, nurses who took multi-vitamins containing vitamin B6 reduced their risk of heart disease by 30%. The more B6 they took, the lower the risk. Could a high potency, high quality supplement reduce risk even more? We don’t know, but a study from Norway shows that a combination of vitamin B6 and folate reduces homocysteine 32% within five weeks in healthy individuals. This has the potential to significantly lower the risk of heart attack and stroke. Other studies show that for every decade of life, plasma concentrations of B6 decrease, and that people who take supplements have a much greater chance of meeting RDAs than those who don’t. There are good reasons to take supplements. The bioavailability of the nutrients in supplements (assuming you buy high-quality) is 100% compared to food which is very unpredictible when it comes to bioavailability. Nutrient content also appears unpredictible. If the vitamin drain is confirmed, it will mean that people cannot count on vegetables and fruit to be the packages of concentrated nutrients they’re supposed to be. In a time when most people aren’t coming close to getting five, let alone nine, servings of fruits and vegetables, it seems pointless to ask them to eat more to get the same nutrients. The USDA is apparently unconcerned and not interested in the vitamin drain, despite its mandate to ensure high quality safe foods. In her letter to Organic Gardening, Ms. Johnson said that the nutritional content of produce is not as important as things like appearance and big yield. In other words, Ms. Johnson espouses the view of commercial growers that food is a product in the same way that running shoes are a product. Looks are more important than substance. That view of vegetables and fruits reduces your spinach salad to pretty roughage, and your chances of meeting RDAs to slim. The USDA can be accessed at http://www.lef.org/magazine/mag2001/www.usda.gov. The food tables are available online. The folks who do the food testing are in the Agricultural Research Service which can be accessed at http://www.lef.org/magazine/mag2001/www.ars.usda.gov. Cleveland LE, et al. 2000. Dietary intake of whole grains. J Am Coll Nutr 19 (3 Suppl):331S-38S. Composition of Foods (Raw, Processed, Prepared): Agriculture Handbook No. 8. USDA Agricultural Research Service. 1963. Cuskelly GJ, et al. 1996. Effect of increasing dietary folate on red-cell folate: implications for prevention of neural tube defects. Lancet 347:657-9. Manore MM, et al. 1989. Plasma pyridoxal 5’-phosphate concentration and dietary vitamin B-6 intake in free-living, low-income elderly people. Am J Clin Nutr 50:339-45. Mansoor MA, et al. 1999. Plasma total homocysteine response to oral doses of folic acid and pyridoxine hydrochloride (vitamin B6) in healthy individuals. Oral doses of vitamin B6 reduce concentrations of serum folate. Scand J Clin Lab Invest 59:139-46. NPD Group, Inc. has a website at www.npd.com. Highlights from the 15th Annual Report on Eating Patterns in America are available online. Organic Gardening’s letter to Dan Glickman, and the response of Phyllis E. Johnson of the USDA - see www.organicgardening.com. Rose CS, et al. 1976. Age differences in vitamin B6 status of 617 men. Am J Clin Nutr 29:847-53. Subar AF, et al. 1998. Dietary sources of nutrients among US adults, 1989 to 1991. J Am Diet Assoc 98:537-47. Subar AF, et al. 1989. Folate intake and food sources in the US population. Am J Clin Nutr 50:508-16.